CAMDEN, New Jersey -- Authorities said 42 people have been hurt after a railing collapsed during an outdoor concert by Snoop Dogg and Wiz Khalifa in southern New Jersey. A partition separating concertgoers from the stage at the BB&T Pavilion in Camden, New Jersey, collapsed, causing people to fall onto the concrete below. It happened shortly before 10:30 p.m. Friday. 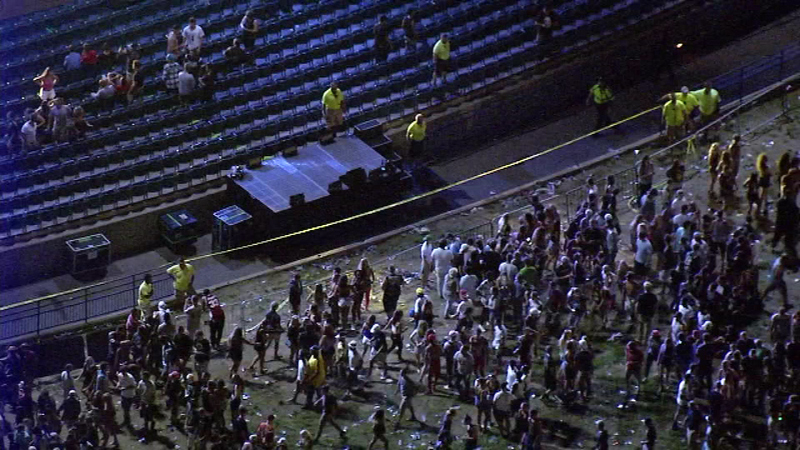 At least 42 people were taken to area hospitals after a surging crowd caused a railing to collapse at a concert headlined by rappers Snoop Dogg and Wiz Khalifa in Camden, New Jersey. "Everyone started running towards him, as, like, fans and stuff would do," said Aubrey Bernanti of Lumberton, N.J. The railing was separating a sloping lawn from a covered portion of the concert hall. The lawn is several feet above a concrete walkway. Witnesses said concertgoers piled on top of each other. "Everyone all of a sudden started pushing," said Abbey Hecht of Lower Merion, Pa. "And the gate broke. And all of a sudden I fell like six or seven feet. And I luckily fell on top of someone so I didn't hit the concrete. But there were, like, maybe four or five people on top of me and it was so hard to breathe. I couldn't move. I literally thought I was dying. It was so scary." There was no immediate word on the extent of injuries to those who were treated. The concert was halted 20 minutes after the incident. The Camden County Sheriff's Office was handling the investigation.